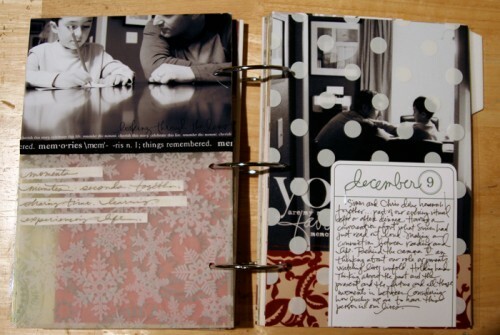 The other day as I was browsing Pinterest and seeing some of my past year's December Daily pages popping up I started thinking about which ones were my favorites (either the concept or the execution of the idea). I went back through all my past albums and came up with 25 of my favorite ideas/concepts/things to keep in mind to share with you today. 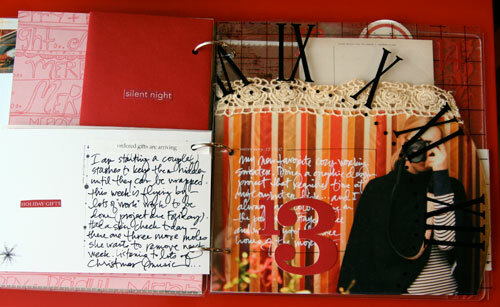 My hope is that this will inspire you as you begin to document your own December in 2011. For me this is a one-story-per-day project. I'm not trying to document everything we do during December and it's not all holiday-related. Just one little (or big) piece of the day gets recorded. 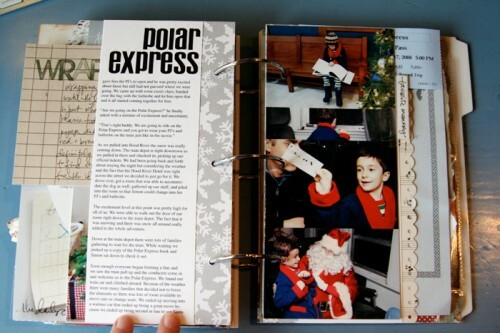 You can bet that there's always going to be a page about visiting Santa and a letter to Santa and something about getting the tree and a day where I include photos from around the house. Intermixed between all those traditions are simple stories, photos, and bits of life during December. 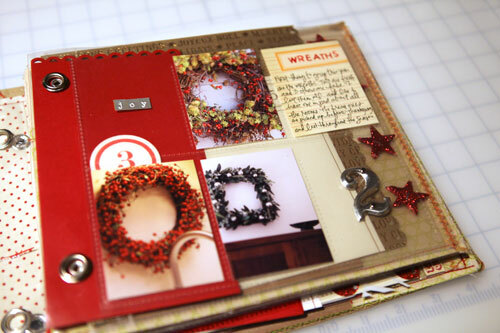 If you'd like more information on this project please check out my December Daily project page. BIG NOTE | Click on any of the images to go to the original post for more information including how-to's and lots more details. Most years I've taken a photo of Simon (and then Anna last year) writing his letter for Santa. 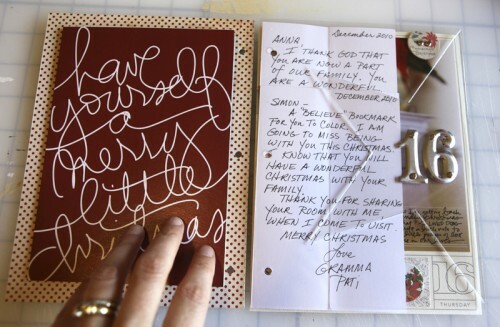 But even if you're an adult without kids you can still write your own letter to Santa. I did it last year and it was fun. What do you want for Christmas? Simplify this process for yourself. Don't get caught up in what you see "everyone" else doing - make it do-able and workable for you and your own personal situation. Take a bit of time to think about what you really want this album to be and how much time you want to take during December. 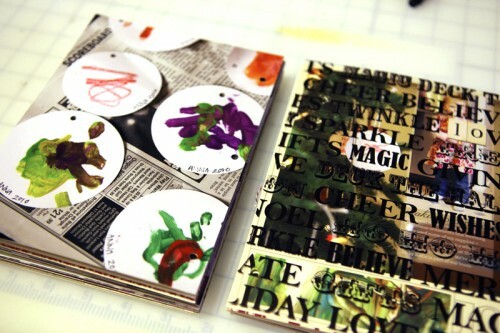 Do you want it to be crafty? Do you want it to be only-holiday stuff? Do you feel like you want to have a photo everyday or are just some words okay? Being realistic with yourself about the amount of time and energy you want to dedicate to this project will lead to a greater chance at completion, less stress, and more overall enjoyment. My albums always end up being a combination based on how I'm feeling on a particular day. When I want things to be super simple just including a single photo works great. Almost all my albums include one day with a single image of a flower or plants. When thinking about what to add on a particular day remember that it can be something as simple as a photo of an area of your home that you love. Not everyday in December has something happening related to Christmas for us. Some days are just regular wake up/school/work days. 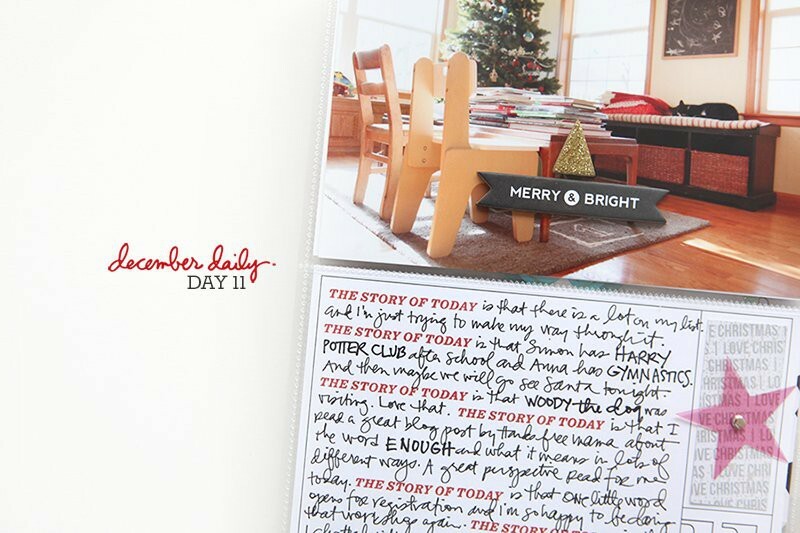 My December Daily albums have always been a mix of everyday life sort of stories and holiday merriment. Don't stress if you don't have something holiay-ish to document. Pick a story you care about on each day and tell it. 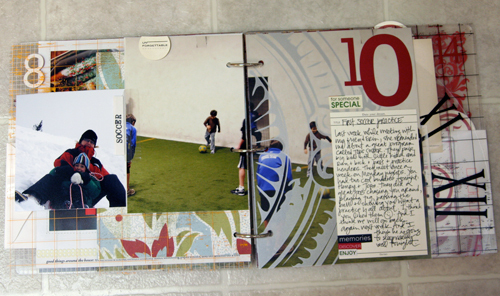 I've included stories about indoor soccer, going to the dentist, learning to share, etc. The everyday stuff is just as worthy as the big events. 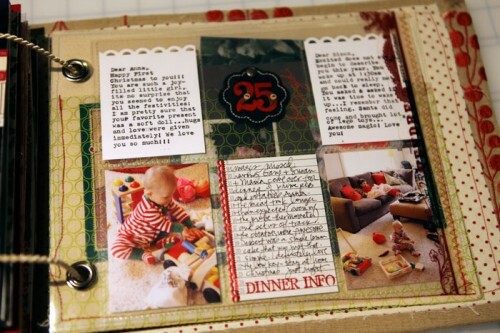 December Daily is a great opportunity to include a photo of yourself. Figure out that self-timer, ask one of your kids to snap a shot, take some of yourself in the mirror, etc. You, as the storyteller, should get in on these stories too. There's something about a group of photos all together that's just really lovely. Most years I include some sort of collage of photos. 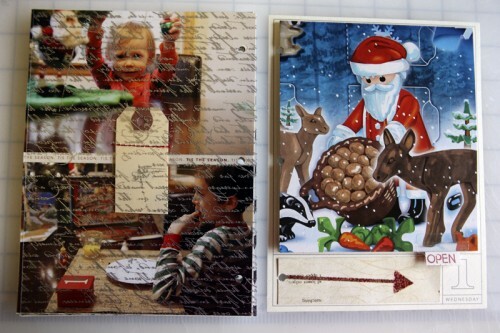 Usually these collages are created in Photoshop using a layered template and sometimes they are created from 4x6 photos using a square punch. I've got digital layered templates available at Designer Digitals to make creating a photo collage easy for you in sizes 6 x 8.5, 6 x 8, and 12 x 12. 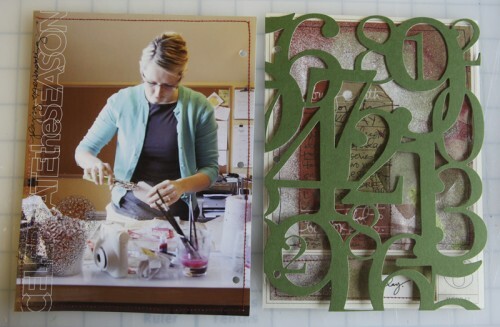 These photo collages can either be printed to use as a page or you could cut them up and add them to a page if you want more dimension. 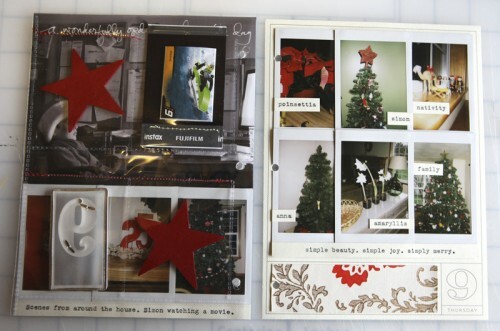 If you need help working with photo collages/layered templates (either digitally or for use on a hybrid page) I've got a video tutorial that I put together last year available here. Don't be afraid to do this more than once in your album. 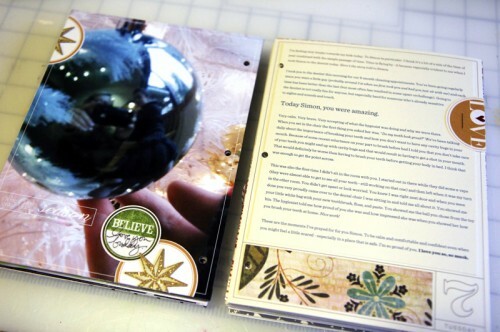 Use images from catalogs or grocery bags instead of pattern paper. Keep your eyes open as you go about your days in December. There's always cool marketing material that can added to your album. 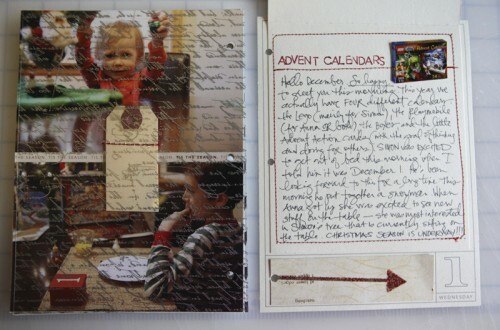 One of my favorite traditions in my December Daily album is to write a letter to my kids. I started with Simon and then when Anna came along I wrote one to her too. If you don't have kids consider writing a letter to yourself (or your spouse or some other special person in your life). 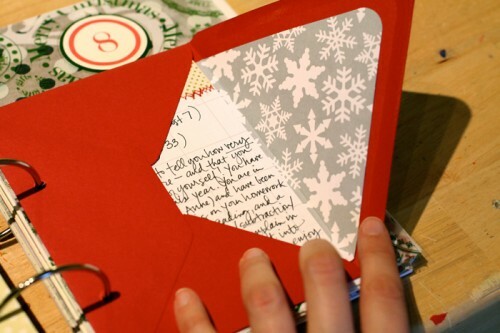 Tuck it in an envelope or simply add it right onto the page. It's a great opportunity to reflect a bit back on the year you've just experienced. Consider including the things you're thankful for about the person or things you're most proud of about yourself over the last 12 months. Make it affirming, kind, and meaningful. Normal life is still happening in December (this one is really pretty similar to No.3). What do your routines look like in December? Are they different than other times of the year? How do you mark this season? Are there daily things you do during December that become routine that maybe you don't do other times of the year (Advent calendars come to mind). Some of my favorite pages from these albums are from days where I told longer, more complete stories. Give a closer glimpse into the things that are happening in your lives right now whether or not they are holiday-related. When you sit down at the end of the day to tell your story, which one feels most meaningful? Which one do you want to remember? Sometimes it's really easy to stick with routine and tradition (and I love both routine and tradition). And sometimes, especially around this time of year, there are really cool opportunities to make new traditions. Make a plan NOW to do something different this holiday season. Add a new "something" - maybe it will be a one-time thing or maybe it will become a new beloved tradition. Make some magic happen for someone you love or for yourself. This definitely goes along in the category of not making things more complicated. 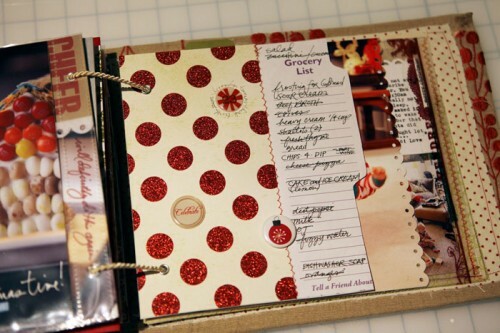 Save that grocery list and add it to your album. Simple, quick, easy and it tells a great story about your life right now. 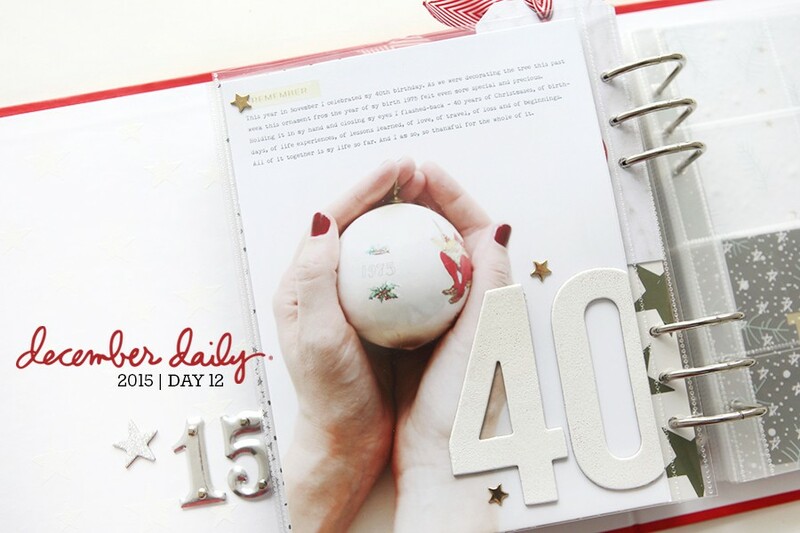 Take photos of your holiday collections and bring them together for the story of the day. I do this at least once, and sometimes twice, a year for this album. Sometimes I'll look around at my decorations and photograph a bunch of "like" things - like the wreaths I've hung. Other times it's a simple random collection of photos showing areas of house right now. 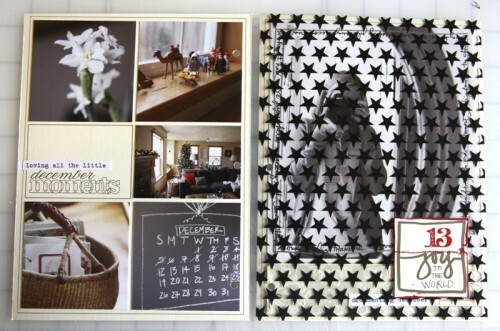 This theme often works great as a photo collage or on a day when you have divided page protectors already set in your album. 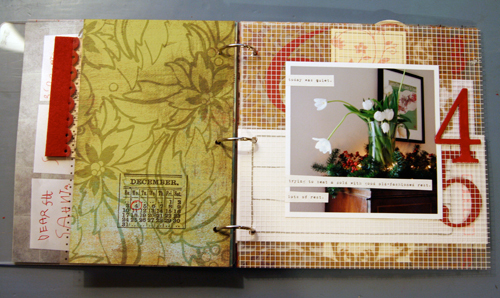 I do all my printing for December Daily at home. For the last few years I used a HP Photosmart B8550 - which was a great printer. 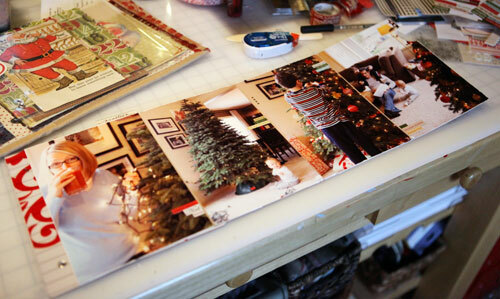 This year I'm using an Epson Stylus Photo R2000 which I also really, really like. 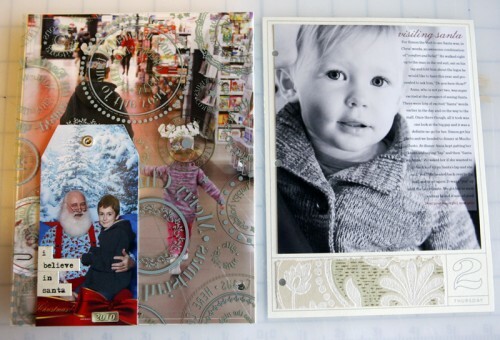 I'm currently printing on Epson Premium Photo Paper (Glossy) and have been happy with the prints. I'll be printing onto 8.5 x 11 and cutting my pages down to 6.5 x 8 to fit into the album I'm using this year. 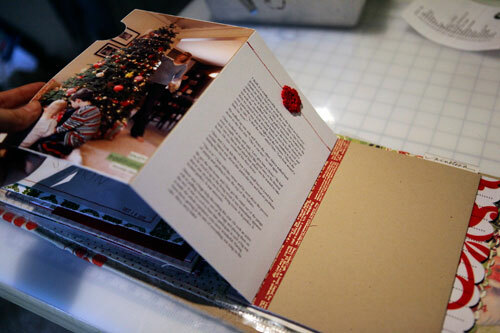 PROFESSIONAL PRINTING OPTION | Persnickety Prints is offering printing for the 6 x 8.5 inch size as an option this holiday season. 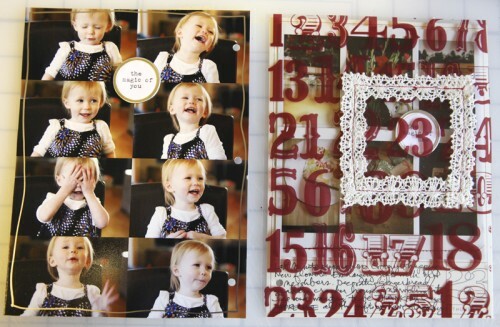 When selecting your printing size choose "Ali Edwards December Daily" from the list of choices. 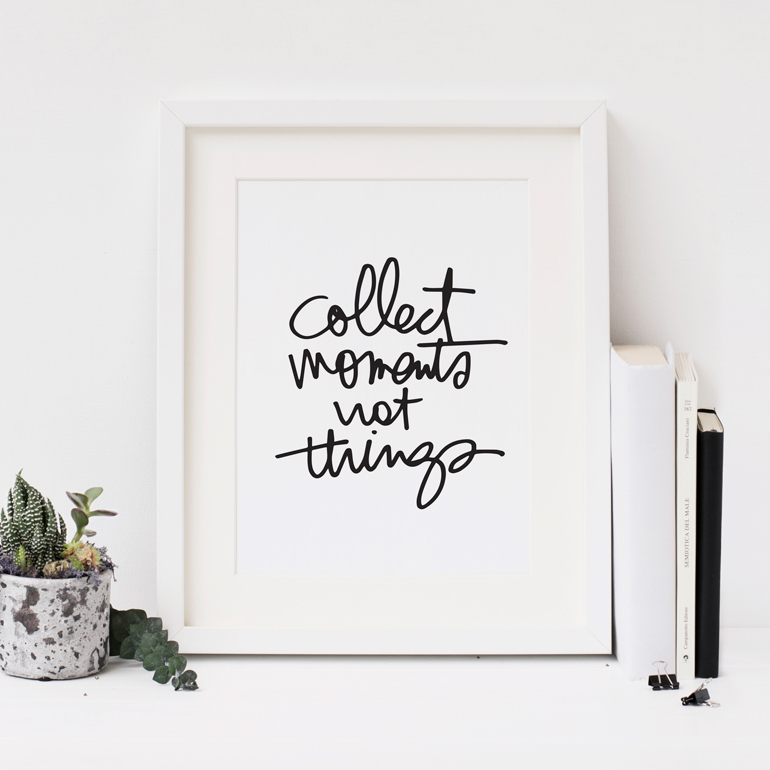 Take your camera, use your phone, take a screen shot something you purchase online, etc. 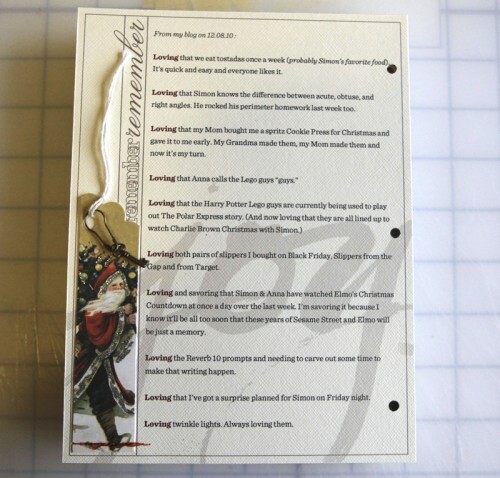 There are lots of story ideas related to shopping this time of year. It's also a great opportunity to write about what you might not be buying or how you're changing things up by scaling back, making gifts, etc. I think including stories about your outlook on the holidays is a great way to tell more about yourself and give context to the holiday hustle-and-bustle. 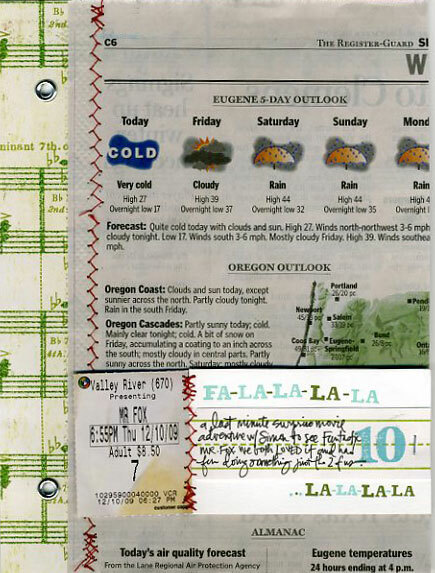 Cut out the weather from the newspaper, print from online, or take a photo from your camera. 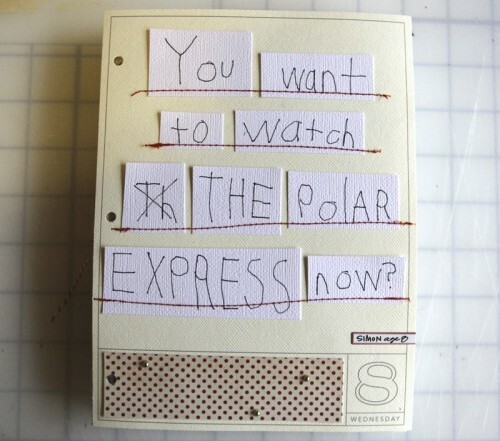 Print an image from the internet showcasing what you or someone in your family are hoping for under the tree. 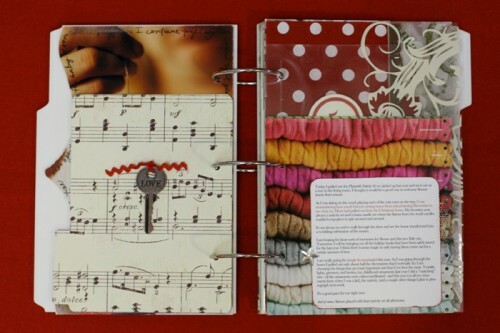 This page took me all of 10 minutes to locate, print, write a bit and then add to my album. On the days when you don't feel like taking a lot of time with this album it's so nice to have a couple ideas that are quick and easy (and are cool in the context of all 25 days). 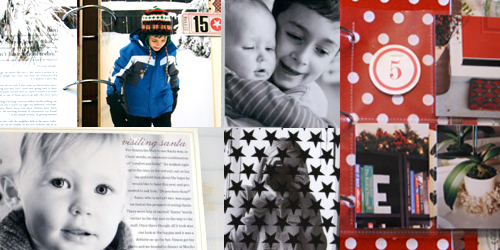 I know many of you use Pinterest to collect visual inspiration for the holidays. 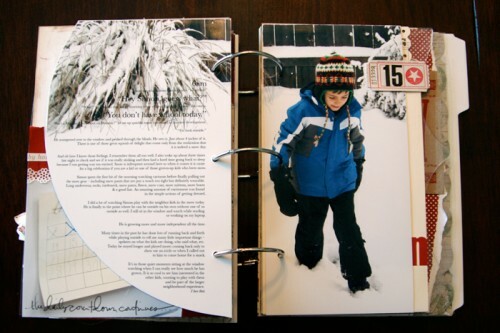 Gather up some of those images or just print a screenshot and add that to your album. I like to pick one kind of wrapping paper to use each year on all the gifts. Add it in just like you would pattern paper. The image on the top is one of my favorites from all the albums. 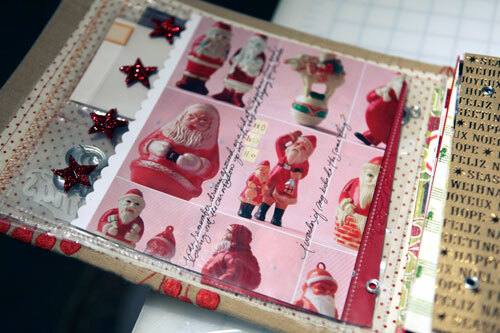 It opens up and folds out to include a bunch of images and a bunch of journaling from tree decorating. I liked that I didn't need to add more pages and was able to keep it within the 2-page spread for the day. 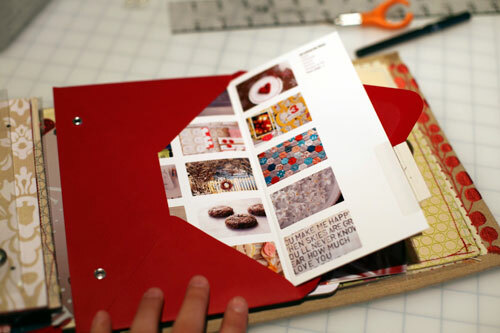 Book-binding or gaffer tape comes in really handy for this technique (add it right along the seam under the photos to keep the pages together). Click on the photos to read more details. 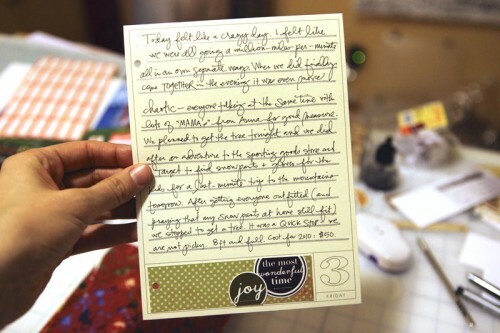 Use "Joy is" as a prompt for your journaling for a day. There doesn't always have to be a specific story. 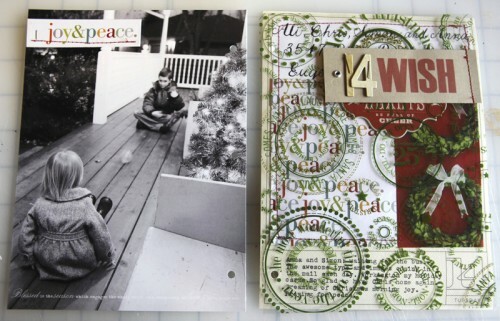 This is a great journaling technique to capture your feelings and favorite facts from this time of year. 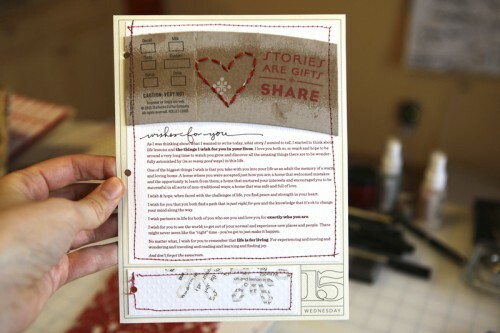 Use that T (text) tool in Photoshop to add your story right onto your photo before printing. When taking photos or cropping your photos intentionally think about where you could add some text right onto the photo. 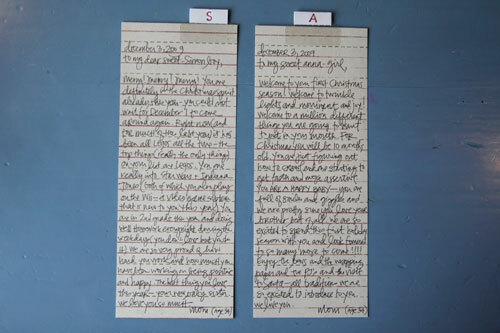 It's also fun to look for opportunities to include things your kids write or maybe a handwritten letter you receive from someone you love (or that was funny, etc). Remember that you can always cut things up to make them fit. No. 23 | USE THE JOURNALING PROMPT "LOVING..."
Similar to the "Joy Is" prompt, it's a great way to get you focused on what's happening for you and your family this holiday season. What are each of you loving? Simple things, big things, etc. Really use this as an opportunity to honor and celebrate all the things that are good (even in the middle of challenges, transitions, frustration, family drama, etc). I've used my iphone, my big camera, photobooths and my Instax Mini in these albums. I really love having the combination of big full page photos mixed in with these smaller shots from the instant camera. I'll likely include some Instagram images this year too. 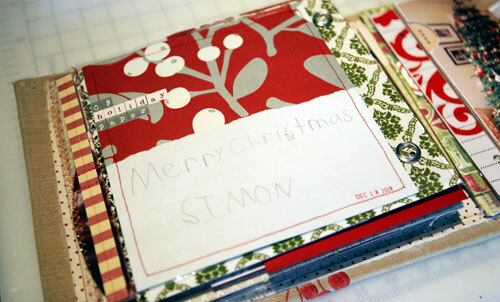 Last year was the first year in quite awhile that I sent out cards. If this is a tradition for you, definitely considering setting one aside to use as a day in your album. MERRY! MERRY! I hope this is a helpful jumpstart as you being thinking about things you might want to include in your album. 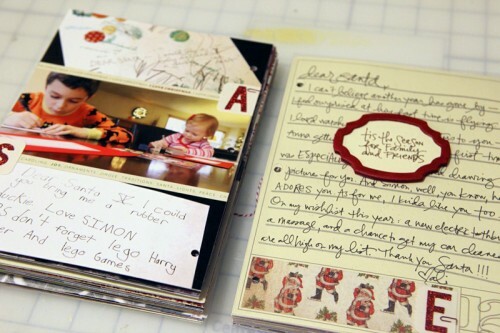 While I was putting together this list I also saw another list over at Two Peas that includes lots of great documenting ideas for December. To be honest I don't do a lot of advance thinking about wanting to make sure I capture this or that. I really like to just let it evolve and go by what I'm most inspired to document on a particular day. On the days when I 'm not feeling particularly inspired it's definitely nice to have some ideas to fall back on - especially the one's that are simple, quick and easy. Thanks so much for this awesome inspirational post! Now I am REALLY in the mood for starting my album! Thanks Ali - another wonderful post. So many ideas - but I love the way you still encourage us to make it meaningful and simple and workable for us too. LOL have literally just finished my witl and ordered a copy of it online - FINALLY YAY!!! Thank you so much for writing this post. I have my album all ready to go and am anticipating the first of December!! I am printing this out so I can have it handy throughout the month. You rock! Ali, this post is wonderful! This will be my first year doing a DD, and now you have me so excited to get started with all of these possibilities. My daughter is older, but I wanted to document our traditions along with the everyday things we do, since I can never commit to doing project life. I will probably be starting my album on today's date because that is usually when our holiday season starts. Thanks so much for your inspiration! What a wonderful reminder of things to do that make DD more meaningful and sometimes simpler. Even though this is year FIVE (woo hoo) for me, I loved seeing your top 25 just to get the juices flowing. Thank you for taking the time to do this post - it was a LOT of work! Have a wonderful Thanksgiving. I am thankful for years of inspiration from you! Ali, this is an amazing post! Thank you so much for taking the time to put it together and then share with us. It's much appreciated. It's such a relief for you to say that you do days that are not related to Christmas. I know that these albums are ours, and we can do what we like, but I'd still like to keep it along the same lines. I don't have children, or a significant other at this moment, so I may not do as many Christmas related activities. I'll still have a bunch though! 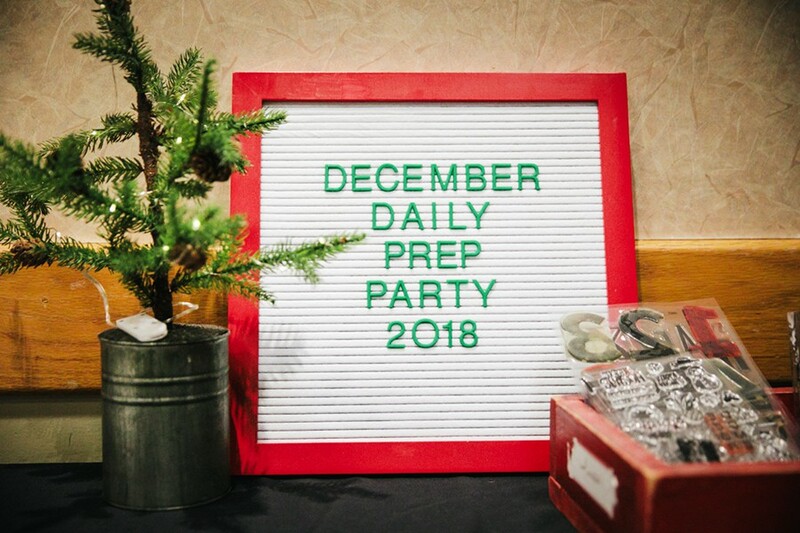 This is such a great post and will help me as this is going to be my first year doing a December Daily. 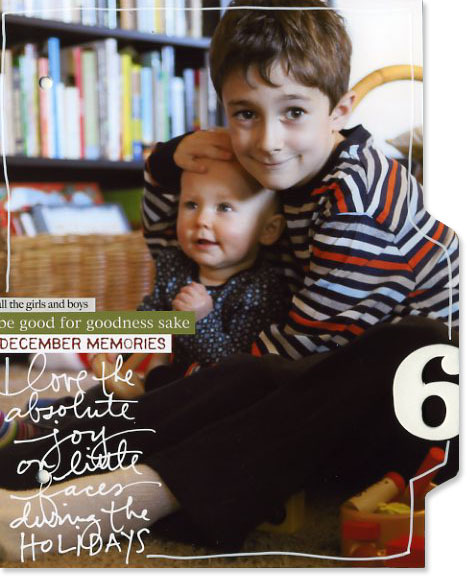 Ali's pages really sing with joy, and her children are absolutely darling! However, I understand your situation. I don't have children either, and this will be my first December Daily album, too. If you are a Christian, as I am, why not write about the birth of Baby Jesus? This is what I am going to journal about during December. I will also add photos of my everyday routine. Since I work, and my life isn't exciting, my December Daily album will be about the true meaning of Christmas -- the birth of our Lord. What a cool post Ali! December is always a crazy and wonderful month, but you really inspire me to make sure I document all the wonderful memories! Thank you for the continued inspiration! I love you Ali Edwards. I am so very thankful for you and your willingness to share your wonderful ideas. Thank you Ali for your thoughtful tips. I've been eagerly waiting to start my 1st DD and I almost have my foundation pages complete. To be honest I had a bit of a panic attack recently about this project and my Project Life...with the reality of the holidays actually approaching and all the preparations that need to be made I'm feeling overwhelmed. I'm a few weeks behind on PL and I'm hoping to get caught up before December. I'm really looking forward to your posts as they are a continued source of inspiration and encouragement! Thank you so much for taking the time and putting this post together. I LOVE it so much. You are such an inspiration. I can't wait to start filling up my album. I "Mod podged" a photo to the front of my album and I love the way it came out. This is awesome. 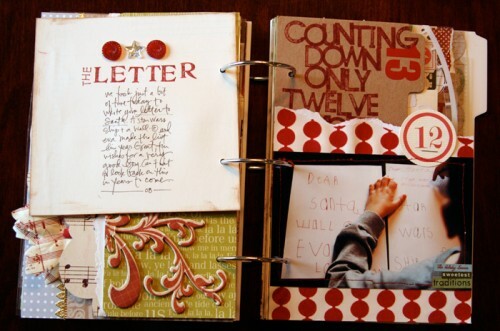 Oh I absolutely love your albums each year and can't wait to see as your pages develop this year. 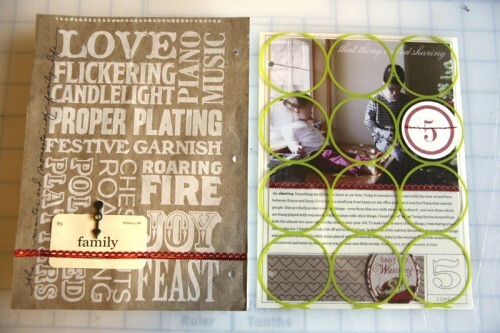 I really want to do one and am thinking I would like to use the designer digital layered templates you created. How easy are they to use if you have photoshop elements 5.0, but don't know how to use the templates. I basically use the pse for fixing photos or should I say trying to fix photos. Hi Sherry - it's a learning process just like everything else (might be super easy for you or it might be a bit of a challenge). 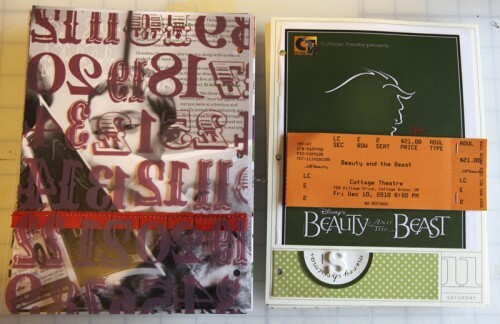 I've got a that tutorial that I linked above and I also have a tutorial and a free download for trying out layered templates available here: http://aliedwards.com/2010/01/scrapbooking-with-your-computer-creating-layouts-with-layered-templates-video-tutorial.html. You might want to try that first :). Wonderful post Ali! Thanks for sharing so much of yourself and your life; just love the pages and feel so much more inspired! Thank you so much Ali for taking the time to put this post together! There's so much inspiration! I have just finished putting together my foundation pages for my very first DD and I'm so excited to get started! 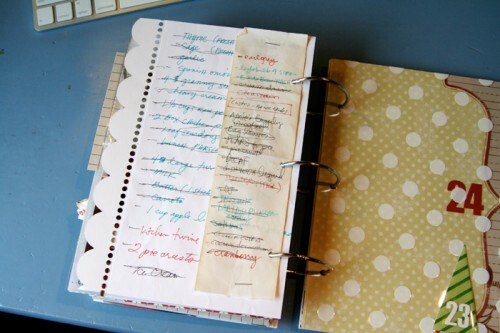 You've given me LOTS of ideas and suddenly I don't feel quite so overwhelmed! Don't know what we'd do without you!! 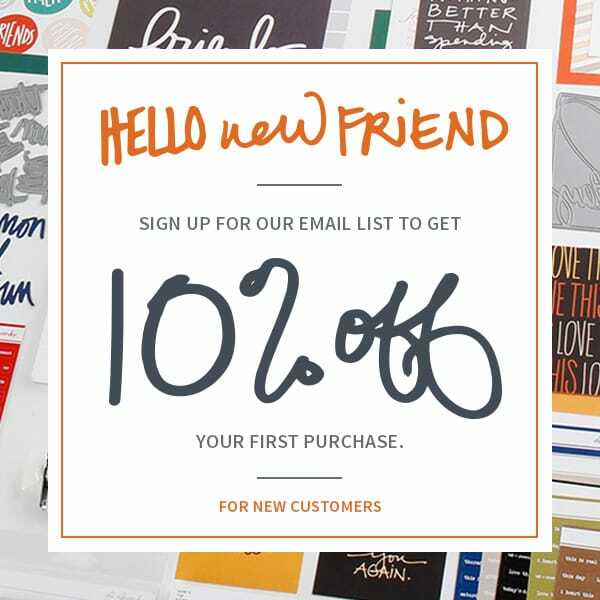 How much are the prints at Persnickety Prints? When I look at the website I don't see that size. Thanks! 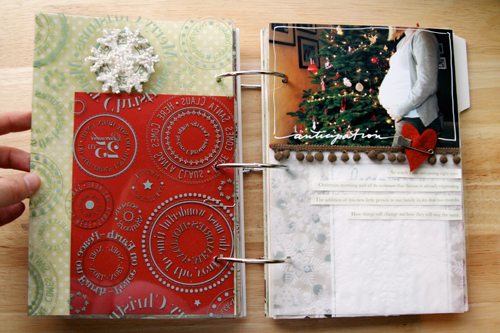 Hi Kaina - the size is called "Ali Edwards December Daily" and they are .89 cents (listed here: http://persnicketyprints.lifepics.com/net/Pricing). Thanks so much for sharing all this, Ali!! 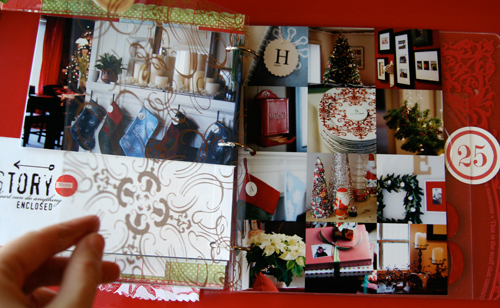 I LOVE all things Christmas and just seeing all these pages are so inspiring..I can't wait for Dec!!! just this morning i have been putting together some touches for my album (which will be 'mostly' digital with some added other touches. the few things i've printed in preparation are those added touches. i realized even before reading this that simple is best for me. besides that i love this list of inspiring insight. it gives me breathing room. Another wonderful list of ideas Ali. You are always an inspiration! Can't wait to get this year's project started! Oh, I LOVE this post! This was such a great idea Ali!! I'm so behind on DD already, but trying to get caught up a little this week! This post is so helpful, it puts my DD album into perspective! I usually think too much about my projects instead of just jumping in head first and doing it-then being happy with whatever the outcome is! I need to just get going and stop worrying about what i'm going to do, how i'm going to decorate, etc, because I'm sure as long as it's finished by the end of the year, I'll be proud! I'll be saving this post, to reference back to again and again throughout my DD process! Thanks so much again! WOW! That was a great post! I needed that since I am getting ready for my first December Daily album. Thank you!! This is a great post to get the creative juices flowing! Thanks for putting it together! This is my first time doing a DD album and I'm so excited. December first can't come soon enough! 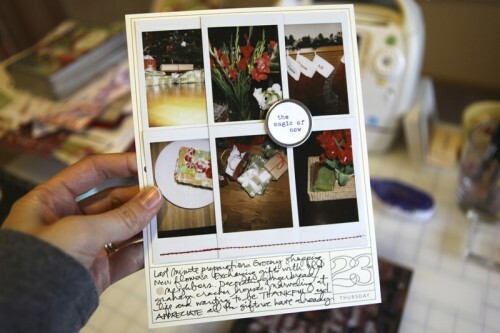 Love your blog and all the inspiration!